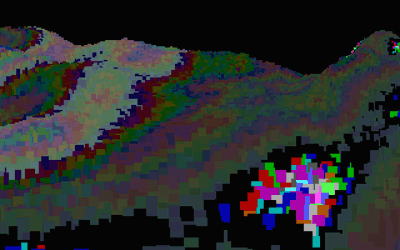 A voxel landscape, I have a long time to see one in 256b, if only the colors were better. "Flying UFO with predator vision" color scheme! HellMood, wow - that's incredible! Good job I hadn't seen that first, or I never would have attempted this. When I thought of doing a 256-byte voxel landscape I did actually do some Pouet searches to see if it had been done before, but I only searched for 256-byte prods. It never occurred to me to try searching for even smaller ones because I assumed it would be impossible! I look forward to seeing the improvements that can be made (I know of a few places where bytes can be saved but I couldn't get those changes to work in time for the deadline, let alone add more features in the space). Would be a solid thumb up even if I hadn't seen it being written at the party. Good work. I saw this on the stream and went "Random colors? No, wait... whoa!" Not just written at the party, but reenigne's first foray into x87 asm. So big thumb up from me. The only fair comparaison to me would be Pluto128 but I don't consider the latter being a contender as nobody ever had it working/running outside an emulator like DOSBox on a real machine for it faults the processor when addressing the stack on odd addresses, for example. Even then there is no camera path as in yours and it relies on a DOSBox-exclusive uninitialized memory residue state for a map. Unsure the comparison with Elevated is sensible for the latter relies on triangle subdivisions iirc, a wholly different technique/feel/render than voxel. It is true the code has some optimizations left out, and real or fake party coding isn't the issue for me because all in all the code size/visual ratio remains better than average still. Lastly I noticed the captured video does not correspond to the released code in the archive : the amplitude of the heightmap is way more dynamic in the video (it looks flater when reassembled). It's not just a bitshift different so I suspect it has to do with the initial map. Which is the correct version thus ? The video or the code released ? In conclusion : noteworthy and very satisfying release,congratulations keep it up ! I also changed the cx loop counter increment to match the Real Time Clock so it runs at similar rate on any machines - it ran too fast on mine (not just rely on a free DOSBox timer specific setting which is akin to cheating). Again reenigne, super work ! The captured video was made with the binary from the archive, which was in turn assembled from the source in the archive (I just went back and re-checked). I think the height amplitude is off because of a change you made when modifying it to build with fasm - you changed "fmul st1" to "fmul st1,st" but it should be "fmul st,st1". What HellMood said, but with a thumb! page created in 0.017266 seconds with 15 queries.